Iron: Maximum Hardness For Weaponry (1018) (Low Carb Steel) BULLET POINTS. If you heat iron and quench in water it will get a bit harder. Quench in oil it will get harder. Hammer while cold it will get even harder like copper/brass/bronze. Forge in coal for long enough in the right circumstance you can carburize/surface harden. Coal forging can help maintain carbon content. Carbon molecules get trapped inside iron molecule formations causing a hardening effect. Less carbon=less effective. What actually happens: Cold hammer hardening. The crystal structure in the steel is forced to deform causing hardening effects. All the above methods are true and work to some extent, but if you find your self in the Zombie apocalypse as has been a hilarious and enjoyable topic as of late then you may need some on the fly Macgyver skills in weapon creation. Once done with you shape use your Ball-Peen (Round side) to pit the flat body of the blade while hot. Do both sides thoroughly. You have through the above process changed the crystal structure of the iron by deforming it while hot. Allow to cool naturally until it is able to be handled. It should be extremely hard if not impossible to bend at this point by hand. Keep thickness at around the thickness of “2 quarters”. Place cold steel on anvil and begin using the round end of your Ball-Peen on the cutting edge and main body. As you hammer, the steel will continue to harden. The blade will now be at maximum hardness and rigidity. If your edge is uneven simply grind/stone to desired level. The result is now much harder, and more durable than quenching because the interior structure is effected more than when quenching in liquide. This is now a primitive but formidable weapon with high durability. I had read some similar info a long time ago but I have always used this kind of material for ornamental purpose, after a week of forging a Athame and the quench actually softened the thin steel, I realized I had actually undone the hardening that occurred while hammering. 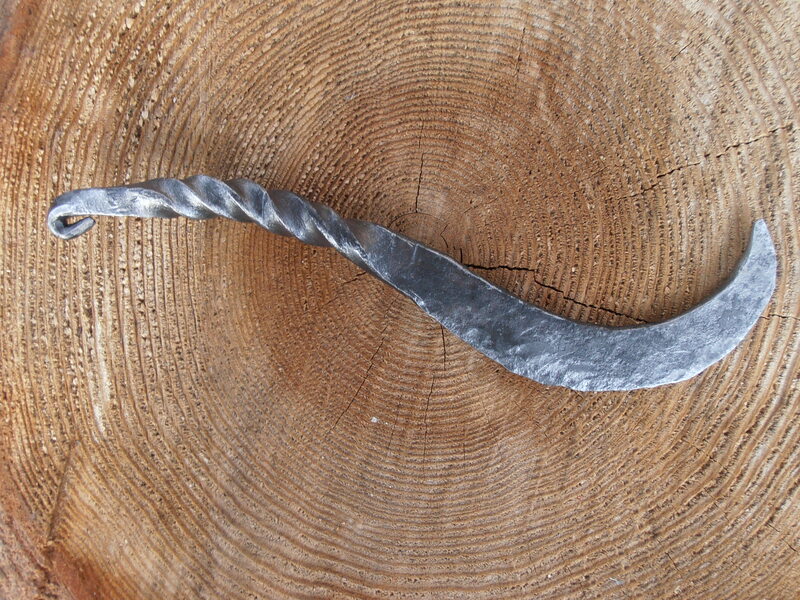 This in my opinion is the best way to finish anything ornamental or otherwise when using a low carbon steel. The end result also looks beautiful! A good technique to remember when crafting an on the spot tool as well. Again nothing will ever make this as good as HC steel but this material continues to be the most fun to test and experiment with. Again not my own original concept I but it has been enjoyable testing it and coming upon it again in a way by accident. Good knowledge to have. This process is more controlled less technical than carburizing steel. Carburizing only effects the surface to a certain depth allowing for a more durable surface to resist ware. This process actually effects the steel throughout and create a more uniform hardening due to deformation of the crystals. Example: hammering from round to flat causes major changes in the crystal structure and also forces more steel into a single area. Another form of this is “Edge packing” As described above when you create your edge by hammering in the bevels instead of removing the steel with a grinder. Know what you have and how it works! Blade (hot hardened) and then cold hammer hardened (No Quench). Will not bend or budge. This entry was posted on February 5, 2013 by .. 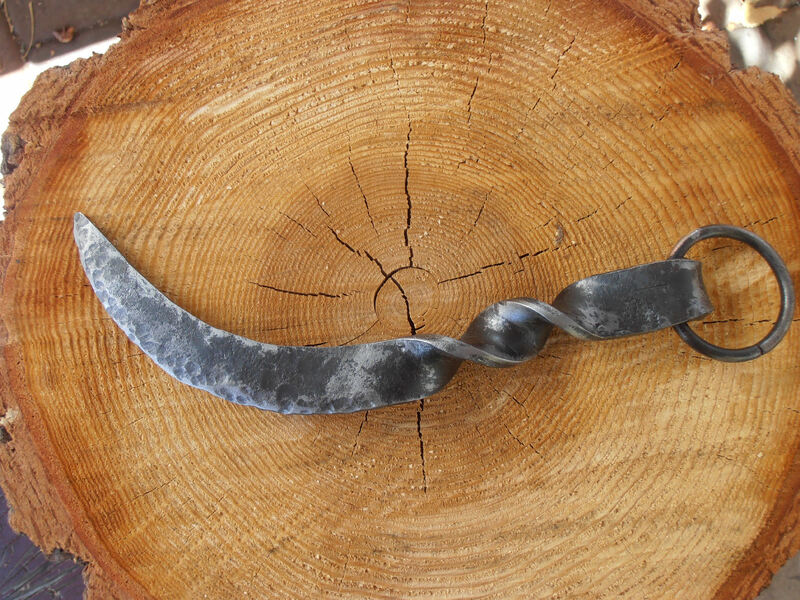 It was filed under Knife making-Blacksmithing and was tagged with Blacksmith, hammer hardening, hardening iron, hardening steel, hot hardening, iron, iron age, iron hardening, iron smith, Macgyver, Survival weapons, using 1018.